GoGoCar provides easy online booking system to easily book and manage taxi cabs as an effective outdoor media. We offer vehicle owners an easy way to get additional income, while professional marketers are now able to start using taxi cabs as part of their integrated media campaigns. All this in a highly accurate and manageable manner - dynamically from nation wide to targeted cities only. Now we also provide a heat map that shows where the cars have actually been. Campaign Goal: To make the brand stronger among decision makers in business. 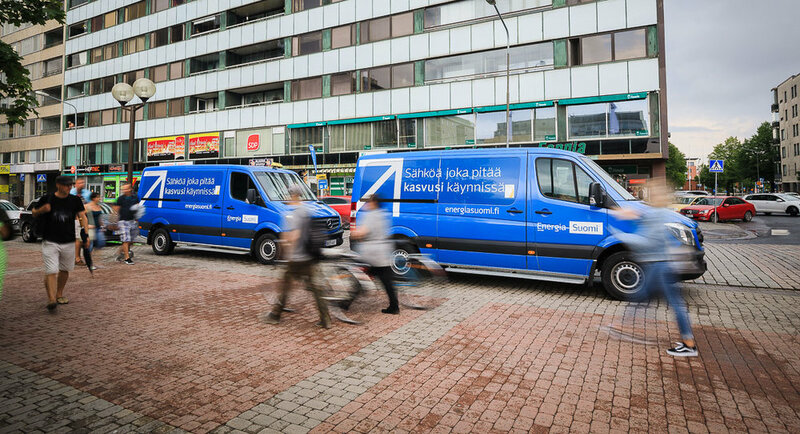 Energia Myynti Suomi had a campaign in Helsinki metropolitan area. Wrapped taxis also made a quick visit to Pori for a weekend where Pori Jazz, Suomi Areena and Asuntomessut had +400 000 visitors. Campaign Goal: To grow conspicuousness of the HAE-123 service in Helsinki. Grano Diesel had their ads in taxis driving in Helsinki area. The message was seen in the right environment - the traffic. Campaign Goal: To grow conspicuousness of Pelican Self Storage brand in Helsinki metropolitan area and in Turku especially among people who are about to move. Pelican Self Storage used vans innovately to reach people about to move. Cars were wrapped in Kulta and Platina level and in addition drivers handed out special offers to Pelican Self Storage with receipt. Campaign reminded peope that rental warehouse is a very handy way to extend your home storage when you are moving or you need more space. Taxis were really easy to spot from traffic and people thought they were moving vans at first, which generated a lot of conversation between clients and drivers who were briefed about the brand. If you have questions regarding GoGoCar or if you want more information about placing custom requests, don’t hesitate to get in touch! Thank you! We'll be in touch with you as soon as possible.